In the heart of the Aravis Massif, in a green setting, you will enjoy an exclusive and authentic renovated farmhouse offering 90 m² of living space. At Villards Sur Thônes, just 6 km from the ski resorts of LA CLUSAZ and GRAND BORNAND, you will spend a pleasant holiday, ideally placed at the start of many hikes. You can also enjoy the proximity of ANNECY and its beautiful lake 25 km away. Beautiful sheltered terrace to take your breakfasts and meals in peace. Spacious and bright living room with sitting area and large table to take your meals. Possibility to provide a cot and a high chair for free on request. 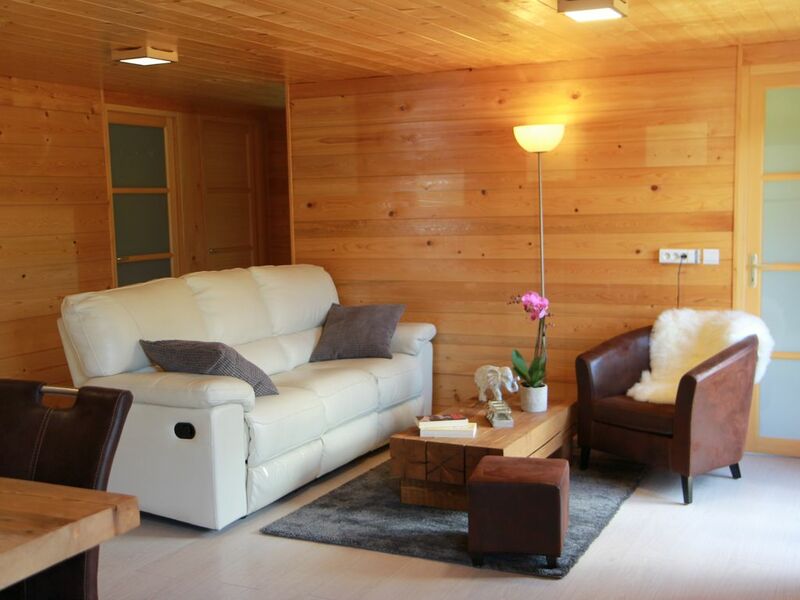 Overall a great stay in a modern chalet which was well equipped and in a good location. Overall this chalet represents great value for money, is modern and well equipped. It’s on one level so was ideal for us with young children. The garage was large, and good for keeping the car and all the ski stuff in. The beds were comfortable, and the shower good, the only slight down side was the water tank size which is small, and to get 2 hot showers in the morning we had to be quick. That might be a problem if more than 2 adults are staying there and all want morning showers. The only other slight problem we encountered was there were quite a few flies and ladybirds coming in from somewhere despite keeping windows etc shut. Might be because it was very warm when we visited. Overall we had a great stay in a lovely location in a very reasonably priced private chalet. Thanks Sylvie. The chalet was in a beautiful location. The building it self was spotless and homely. Very private. Great supermarket close by for food and fuel. Everything you needed was included. We thoroughly enjoyed our hiking on foot from the chalet. Sylvie is very friendly and a great host keeping you informed pre arrival, checks that’s all is good on arrival and ensures you’re well during the stay. All without feeling overwhelmed. The house is lovely, very spacious, clean and very well presented inside and out. More than enough equipment to do anything. High up on the hill side you get stunning views of the valley and mountains. Great Intermarche 200 mtrs down the road. Thônes is a lovely little town and an short drive to Clusaz. The drive to Annecy is easy and spectacular as you approach. We cycled a lot for the Cols which are great to access from the house; Aravis, Croix Fry, Colmbièrè right on the door step. Have no hesitation to recommend Sylvie’s house and the area. I’m sure I’ll be back in the future with the family. Nous avons passés un séjour de qualité supérieure ,très beau châlet bien équipé et une très situation.le temps n'était pas de la partie mais le Logis suffit a redonné le plaisir de la montagne,silence et exposition parfaite ,le garage est au top .Une proposition pour les équipements de ski ,une petite pièce chauffée .mais cela reste une proposition.encore une fois bravo aux propriétaires.Une question nous n'avons pas reçu notre caution ? Votre caution va vous être remboursée automatiquement par Abritel environ 10 jours après la fin de votre séjour. Le chalet est très bien équipé, agréable et à proximité de la Clusaz et des commerces. Nous avons passé un très bon séjour. Le chalet est chaleureux et confortable. Les hôtes sont arrangeant mais c’est dommage que nous n’ayons pas vu les voir ni à l’arrivée, ni au départ.